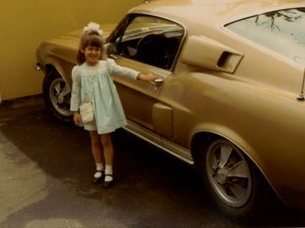 This is the story of the first 1968 GT500 fastback built. This car, like three others built at the same time, was an engineering car. Unfortunately, the story of 8T02S110575-00041 took a sad turn in the early 1970s. The car was stolen and has not been seen since. The picture above shows John's lovely daughter and the car. We know this car was one of the first four 1968 Shelbys built. It was built alongside three other gold cars. Together the four cars were turned into the first four Shelbys in October of 1967. Each of the cars was assigned to Shelby Engineering and used for various tasks. One car became a Hertz show car (# 301), the GT500 convertible (# 56) was used to test the 428 Cobra jet supercharged engine and car # 41 was used to test the Conolec Fuel injection system. The car's original 428 Police Interceptor power plant was replaced with a 428 Cobra Jet engine. These were not the only four cars assigned to Shelby Engineering. The Shelby American Automobile Club has documented several others. It is believed these cars did not retain their factory "modifications" when they were sold new. John Q. purchased #41 in the fall of 1968. The car was sold new at Courtesy Motors in Denver, Colorado. John states the car was a "demonstrator". John recalls the car had the original hubcaps and a Cobra Jet engine. John, who was in the Air Force, took the car with him when he moved to the Pacific northwest. The car was stolen in 1973. About a year and half after the car was stolen, John recieved a copy of parking citation in the mail. The ticket was written at a small community college near Bend, Oregon. Bend was 150 miles from where the Shelby had been stolen. John called the police, but they were unable to turn anything up on the car. The first GT350 Convertible built: 8T03J110577-00301, a gold and black, 4spd. The first GT500 Fastback built: 8T02S110575-00041, a gold and black, Automatic.